I made so many jars of pickled jalapeños last year that this summer (2015) I didn't plant any in the garden beds - just a few plants in pots. But still so many that I made this no-cook "Sambal Oelek" chili paste (Peter). Basin of washed Jalapeño chilis - best if all red (other chilies would do fine too I'm sure) - other chilies also work great! 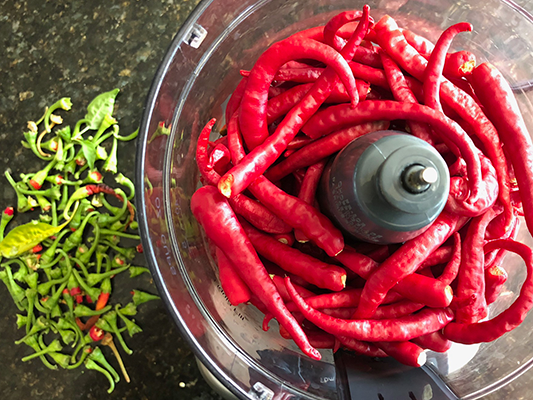 In 2018 we tried this recipe with our (much hotter and much smaller) cayenne peppers - worked great. 1. 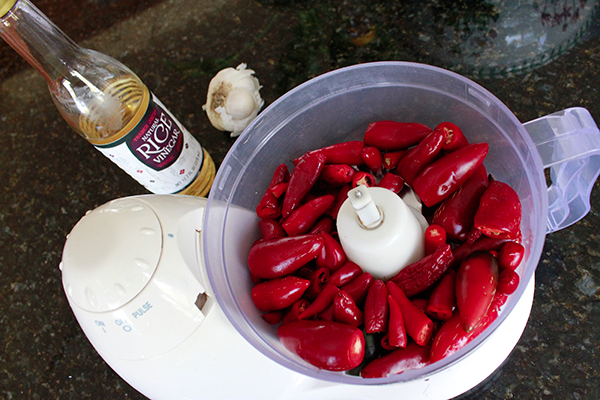 Dock chilies and add to food processor with garlic, salt and sugar. 2. Add half the rice wine vinegar and pulse food processor. 4. Spoon mixture into jars then seal. 6. Standard warning: I have used this recipe and eaten the results in other recipes over 6 months. But I do not guarantee this process and users of this recipe must make all proper inquiries and assume all health & safety risks.